Every time we eat Swiss Chalet, the hubby gets Chicken Pot Pie. I don't care for savory pies though so it's not something I order. Then I had an idea to use biscuits instead of pie dough. OMG, delicious! These savory buns got devoured! 2 packages of Pillsbury Country Biscuit refrigerated dough. In a bowl, combine all ingredients listed except the dough. Set aside. Using a muffin pan, take the portion of biscuit dough, and form it gently with your fingers in each hole. Make sure to make them deep enough so you get enough mixture in them. Once you have them ready, fill them to the top but not overflowing with the mixture. Then place them in the over for 20 minutes or so, until they are golden brown. Don't worry, they come apart very easy, but let stand for 1-2 minutes when you bring them out of the oven. OMG, Freda! These sound so scrumptious. When I was a kid my mom made chicken pot pie but it was a big one and I always wanted more crust. And biscuit dough? Nothing better! Thanks for the reminder and printing the recipe! A co-worker has brought them to lunch a couple times this winter and they look so good, and sound easy! 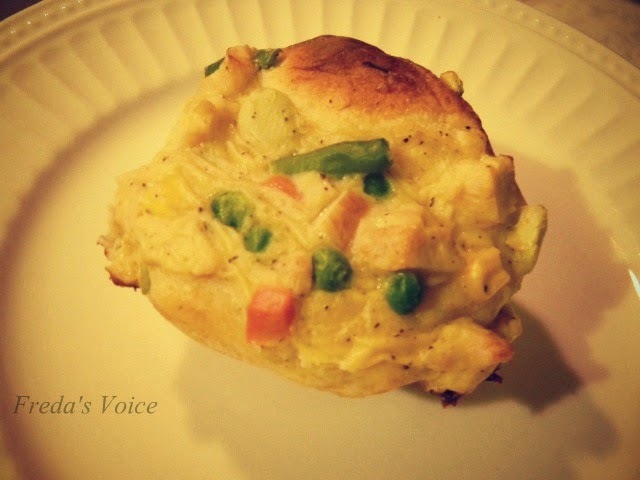 One of my favorite "comfort" foods year round, have recipe but have not tried yet but am getting hooked on muffin tin meal cooking. Yes please! I need to make these RIGHT now! A most delicious idea, thank you. Those look so good! What a delicious idea! 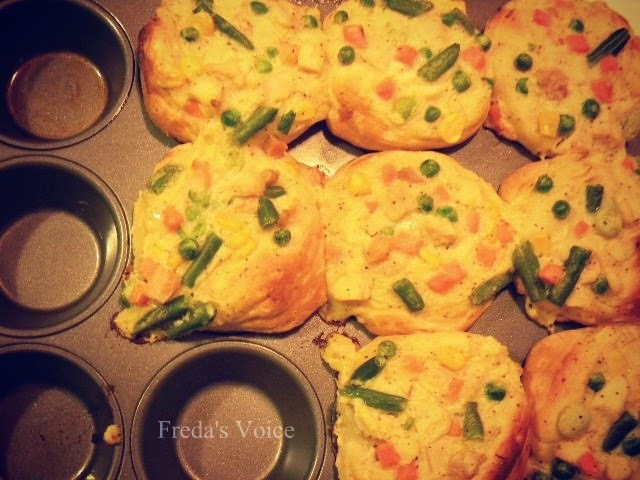 What a great recipe Freda! I will try my hand at these! Looks so good! Your recipe also inspired me to get creative , and I use ground beef, chopped onions and bbq sauce and the Pillsbury biscuits on top, it was really good. These are a great idea! Biscuit mix is the perfect crust, and these don't have to be eaten with a fork. This recipe looks good and simple, especially with the use of the biscuit mix. Thanks for the recipe. These look super good. Thanks for sharing the recipe. These look so yummy. I really like your idea to use biscuits instead of pie dough.